Because students interested in Linguistics often come from diverse backgrounds and may not have had the opportunity to major in Linguistics as undergraduates, each applicant is considered on an individual basis. Prospective students who have the PhD as their goal, but do not have an MA in linguistics should apply for the concurrent MA/PhD track. Applicants should apply for the MA and specify in the personal statement that they wish to be considered for the MA/PhD. Students applying for the concurrent track must otherwise meet the minimum requirements for the PhD. Concurrent admission is determined on a case by case basis by the Admissions Committee; expressing a desire to be considered for it does not guarantee placement in it. Students admitted to the concurrent track typically earn their MA in Linguistics, although in some cases they may earn it in a cooperating graduate MA program. Currently, the Linguistics Program has such a cooperative agreement with the Department of Languages, Literatures, and Cultures. Applicants for the concurrent track in the Linguistics Program and another program must submit separate applications to each academic unit. The personal statement to each program should specify that they are applying for the concurrent track in both programs. In all cases, minimally acceptable scores and grades are no guarantee of admission. At the same time, evidence of high potential from several parts of an applicant's file may occasionally outweigh a low test score or GPA. Students are normally admitted to the program in the fall semester. To receive full consideration for financial assistance, applications should be completed before the first round of selections (December 15). The absolute deadline for applying is May 1. 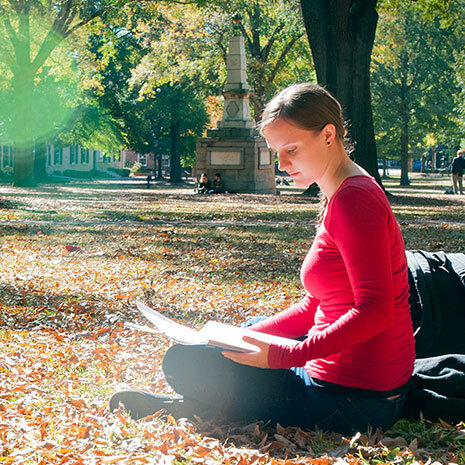 Applications submitted outside of the fall admissions cycle are rarely considered, and only possible if the student has taken a graduate survey in linguistics. Graduate assistantships are awarded only to students entering in the fall semester on a highly competitive merit basis. Prospective students who do not have prior coursework in linguistics, or whose coursework in the discipline is at the undergraduate level only, should apply for admission with a start date in the summer session of respective year. The Linguistics Program at the University of South Carolina makes the financial support for its graduate students a priority. All PhD students in the program are fully supported for 4 years. The program has been particularly successful in securing additional support through the University of South Carolina Presidential Fellowship Program, the University of South Carolina Presidential Teaching Fellowship Program, the College of Arts and Sciences Dean’s Dissertation Year Fellowship competition and now has additional opportunities for fellowship support through a generous endowment from the Bilinski Foundation. Additional funding is available on competitive basis through the Graduate School and the office of Student Financial Aid and Scholarships. Have questions about the Linguistics Program? Contact us! Whether you are seeking a master's, doctorate or postgraduate certificate, we make your application process as simple as possible.